Ever had fresh chamomile? 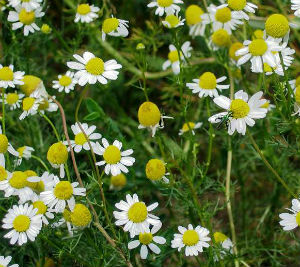 While wandering across Scottish cow-pastures with my adventurous young pals, we often snacked on chamomile flowers, though we didn't know what they were called. They are sweet, chewy, and taste like no dried chamomile ever could. It would never have crossed our minds to take them home for a salad, because we were Scottish. The definition of a Scottish Salad is: "The green stuff that you leave on the plate." But chamomile's fondness for cow-pastures is nothing compared to horse-mushroom's fondness for their namesake. I can't find a photo, but in Britain, horse-pastures sometimes bloom to the point where you can't see the grass. Everybody in the village would take home pounds and pounds, and then come back in a few days and do it again. My young pals and I discovered things to eat that few people knew about, like young wheat stems. Farmers know that young wheat grains are tasty, but we also discovered how to eat the growing stalk. The light-green ones above are perhaps just a little old to eat the grains, but if you grab the head and pull gently, the growing stem that slides out of the stalk is wonderful ... for about the first two inches, no more. Rose hips are something else altogether, and quite dangerous if not eaten properly. But I'm kinda hogging the thread here, so I'll wait on that one. Queen Anne's Lace? Fresh flowers like the ones below are quite tasty. When my sister and I were young, our parents would take us into the 'country' for a Sunday drive. Without warning, dad would pull over, mom would produce two paper shopping bags from out of thin air and my sister and I were directed to go pick grape leaves from the vines growing on a fence by the side of the road. She'd blanch them and can them in salt water. The leaves were used to make sarma, the Armenian equivalent of the Greek dolmades. We also made yelanchi, a cold appetizer. Among my extended family, this is the hands down favorite appetizer when we get together. I've made it a couple of times but he process of rolling the grape leaves with the filling is not a task I look forward to. The linked recipe gives you an idea of what they're like but my mom's recipe is different. You could go with this lazy version, sort of a grape leaf lasagna! That's interesting, Aunt Bea. I've never seen anything like that. What a brilliant, easy recipe! And it immediately got me to thinking: why not make actual lasagna, from grape-leaf pasta? The recipe would be identical to making spinach pasta, but would be more full-flavoured. I just now googled it, and it looks like it has never been thought of before. To make it, gather only bright young leaves of any size, because they contain less fibre. Then treat yourself to a copy of Aliza Green's "Making Artisan Pasta" and never look back. Now, what would one put IN grape-leaf lasagna? Ideas? A layer of kefta-spiced ground beef, a layer of baba ghanoush, repeat, top with a lemony béchamel. Bake and dollop with tabouli for serving. I am new to this forum (glad to be here!) and this is my first post. I probably should have started in the Newcomers area but this is a topic dear to my heart! Just wanted to say to OP ErehwelseFox in regards to getting your wife interested in foraging: We took a class last year on how to find morels and other wild mushrooms. I've picked berries and wild asparagus all my life, but I can't tell you how exciting it was to look down and see a morel popping out of the ground after following the instructions we learned in that class! Our guy was in MN, but perhaps you could find someone in your area who specializes in what you're interested in foraging. A class might make that "crap in the woods" seem more official to her. A class might make that "crap in the woods" seem more official to her. Glad to have you on board KH. And we are just about to get to great mushroom foraging season. I'm going to go out with my basket this weekend, and find hopefully some greens, wild onions, ramps, and some flowers. Anyone else getting ready for Mushroom season?